Pinno and Pinnette, two clothespins, are getting acquainted while they hold a quilt on the line, when the ugly Black Spider threatens Pinnette! Pinno rises to her defense, but in his eagerness falls to the ground. He is discovered by Mrs. and Junior Ant, and revived by Dr. Beetle with the help of some odd instruments — a saw, an axe, a bicycle pump, and a dinner bell! But no sooner is Pinno revived than Pinnette tumbles into the Spider’s web! It takes all the efforts of Pinno and his hilarious insect posse to rescue her. 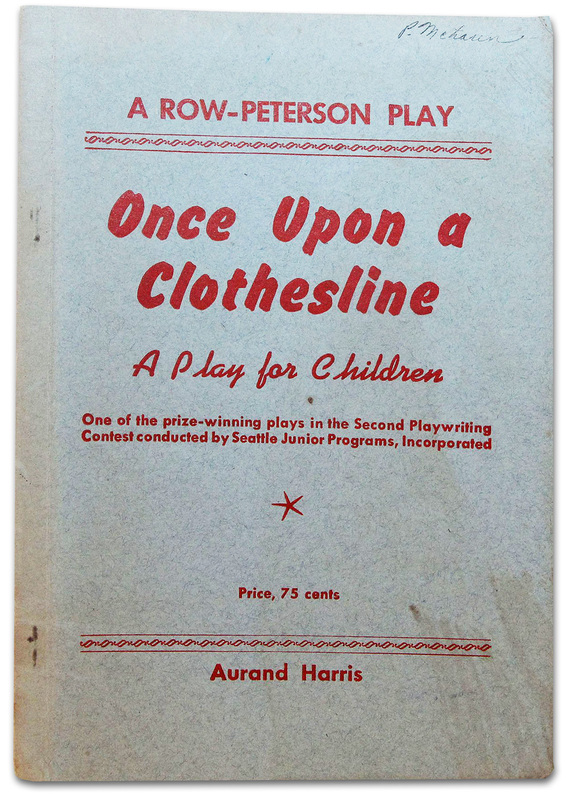 Once Upon a Clothesline was a prize-winning play in the Second Annual Seattle Junior Programs Playwriting Contest. This production featured the intermediate group of sixth, seventh and eighth grade students from the 1951 Summer Theatre Workshop, performing in the Recital Hall at the Palisades Building in Balboa Park. This play was to later go on tour at playgrounds throughout the city. Speaking of bugs, director Signe Culbertson was assisted by James Sams, director of the Education Department of the Natural History Museum. Written by Aurand Harris. The first production of Once Upon a Clothesline was by the Campus Players of William Woods College, under the direction of the author, Aurand Harris. Presented through special arrangement with Row-Peterson & Company, now Samuel French, Inc. 45 West 25th Street, New York, NY 10010. Phone 212-206-8990. Fax 212-206-1429. www.SamuelFrench.com. Production sponsored in part by the San Diego Community Theatre, the City of San Diego Park and Recreation Department, and the City of San Diego. Sources: “Junior Theater Presents Two Balboa Dramas,” The Aztec, 13 Jul 1951, pg 3. “Comedy Player,” San Diego Union, 18 Jul 1951, pg. D-4.